In the northern hemisphere, the summer travel season is upon us.Â My friends and rellies in the southern hemisphere are planning their winter ski vacations. And every traveling knitter, no matter where you are in the world, has one key question in mind: can I take my knitting on a plane?Â The answer is an enthusiastic but qualified yes. Within North America, the TSA clearly states that “Items needed to pursue a Needlepoint project are permitted in your carry-on baggage”.Â Read their post for a bit more detail.Â The Canadian Air Transportation Security Authority agrees. Within most of western Europe and the UK, and between North America and Europe, they are also permitted.Â These Heathrow Airport Security guidelines state that knitting needles are “widely prohibited”, and says that you should ask your airline, but doesn’t outright tell you not to bring them. I’ve flown in and out of Heathrow a number of times in the past few years, and not had a problem. The only exception seems to be France, which has an outright ban. Although they have announced that the policy will change, right now Australia remains the most restrictive, qualifying knitting needles as “dangerous goods”. New Zealand permits them, however. Ultimately, no matter what the airline and government regulations are within a given territory, you’re still at the mercy of whoever is manning the security checkpoint. To reduce the chances of confiscation, take wood, bamboo or plastic needles rather than metal.Â If you do want to take metal, I recommend short circulars – I’ve not had any problems with them.Â And this sounds silly, but don’t ask the question or bring attention to them – just stuff your equipment in your carry on bag and send it through the x-ray machine.Â “Needle” is a word that has many meanings, some of them scary, and you’re more likely to get attention if you’re overheard using it.Â Have your knitting cast-on – I’ve heard of some people being questioned for having needles without knitting on them. I also tend to pare down my kit when I’m traveling – to save space and hassle.Â I leave my scissors, metal ruler and tins of safety pins at home or in my checked baggage. You may be asked to surrender your needles, so don’t take your favorite ones on the plane. When traveling, I always transfer my knitting to inexpensive needles I wouldn’t be upset about losing.Â If you don’t want to lose them, carry a self-addressed, stamped puffy envelope with you so you can mail them home.Â Thread a lifeline before you leave for the airport so that if you do have the surrender the needles, your knitting can be salvaged.Â And bring something to read, just in case. And just because you arrived somewhere with your needles doesn’t mean you’ll be allowed to leave with them – there may be different rules at your departing airport. But most important of all, remember that yarn bought while traveling doesn’t count as stash, it’s a souvenir! What a great posting! Thanks for including much valuable information on this topic. I know many knitters who err on the side of caution and pack their knitting in their checked luggage (which highly defeats the purpose, if you ask me, but at least it is safe from security). I usually call the airport authority first before attempting to bring knitting on. The rules are left up to the discretion of the security personnel. So to be safe rather than sorry I give a quick call for it wouldn’t do to have a security guard/knitter covet my yarns, projects, needles, etc. ; would it? i traveled to NZ and Australia last summer, and knitted a scarf on pencils. i also knitting on cuticle sticks. we are flying through Copenhagen and Paris from Dulles this summer, so I will have to plan. i usually pack rather dullish-looking needles with my projects when i am flying around. thanks for posting this! Although I travel with my knitting frequently in the US, I have a trip to canada next month & I’ve been meaning to look up their needle/airplane policy. thanks for saving me the trouble! & I love the pre-threaded lifeline idea. i’ve always carried something so I could thread one if needed but never thought to just have it all ready. I had my dp on the thumb of my mittens in the carry on and they went through xray and the first search ok but the second search she was rummaging around in my bag so much (I didn’t want her to get poked)that I warned her that my needles were in the bag and she said they were not allowed. She only took 3 of the 4 though, she didn’t find the crochet hook either! This was traveling between LHR and LAX. I told her they were allowed and that I’d travelled before with them but they were all in bad moods that day, our flight was delayed 4 hours and they had had to search us twice because of the delay. The time before I asked security while still in line and they made a big fuss and checked with their superiors and were going to give me a special bag to put the needles in and then they got a phone call that told them knitting needles were OK, much to their surprise!! Travelling is always an adventure nowadays! I always swear I’m not going to take anything in my carry on but always end up with a load of stuff! I had not knit for 20 years and then figured out I could knit on airplanes. Since I travel almost every week this is pure pleasure in the nightmare of airports. My knitting obsession is back and I am a much more relaxed traveler. Excellent tips! I’ve followed most of them myself, although the lifeline one is new to me (and something I will be happily employing from now on). Although, my biggest problem isn’t “what if they take it away” — it’s “what if I finish it and don’t have another project to work on”! I’ve had no trouble taking my 16″ metal circulars onboard domestic US aircraft, for the record — I usually fly out of Chicago Midway, too. My big wooden 10.5 needles have made the trip, too. I’ve been too cautious to bring my tiny steel 1.5 DPNs, though — they look too dangerous and I couldn’t bear losing them for a crappy reason! I was flying out of Hethrow two months ago with short bamboo circulars that had my knitting and a set of short metal circulars that were empty. The gate told me neither set of needles were going on the flight. I think the panic in my eyes and my husband saying that I would probably be more of a danger without the needles than the needles themselves were (on a seven hour flight) got them wondering so a supervisor was requested and after much debate they let me and my needles board. I strongly agree with the envelope recomendation otherwise I would have left a month of knitting in London. . . . how sad! 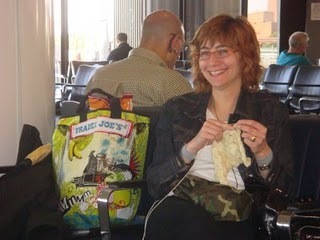 I have never had any problem with knitting on a plane, and I have flown domestically all over. I usually take socks or a shawl to knit and DO pare down my knitting kit as well as carry a self-addressed envelope. I look at it as my “talisman” against grumpy TSA employees. I look at it this way, since I am not always a relaxed flyer (OK, I’m NEVER a relaxed flyer), having me fly WITH knitting needles is a whole lot safer than trying to take them away from me! My favorite story is from Lily Chin. When things were really restricted after 9-11, she used to put her knitting on a lifeline, twist her hair up on her head and secure it with one of those old plastic Boye circs, get on the plane, take down her hair and knit. That’s brilliant. Shame my hair’s short — we’re flying out of Paris this Oct! Maybe I could make a bracelet out of it? Currently sitting in a concourse waiting for my *delayed* flight, and awfully glad I have my knitting! I’ve flown all over the US, Canada, and Western Europe with no problems but I just got back from a trip to Peru where my needles were almost confiscated. I was allowed to go back to the ticketing counter and check them which thankfully my schedule allowed. I have heard of other knitters having similar problems in Central and South America. I was traveling to Aussie and NZ last Oct/Nov and got through security no problem – I did have an issue on the plane though – took out my sock knitting (on 2mm harmony wooden needles) and the stewardess looked as me as if I were a total deviant and told me to surrender my knitting. It got locked up with the pilot in the crew area for the entire flight from Sydney to Christchurch (thank goodness it wasn’t the Frankfurt/Singapore leg!) I travel frequently within Europe and N. America and this is the only time I have ever had an issue. I’ve flown to Paris and back with bamboo circulars and lots of knitting attached — most recently in December. Never had a problem. I was on Air France, if it matters. Circulars are always better, I find — no invasion of your neighbor’s space, compact size, and on a long flight, just good to have. Magazines are key though, just in case. However, Canadian security flipped out when I flew from Toronto to DC last summer — seems they’d never seen an Apple MacBook and the power cords before. I was not pleased with the secondary search. See http://www.citizensinformation.ie/categories/travel-and-recreation/air-travel/security_issues_and_baggage for more info. I’ve never had a problem wih needles in France. I just returned from Paris where security could have cared less. All of my projects were on circs which might be the reason. I had an Air Canada stewardess (?) tell me she had to check the points, for pointiness, while we were waiting to take off. They were pretty pointy in my opinion, but she declared them fine, LOL. Then she said I couldn’t knit during take off! Argh, the most stressful time of the flight! PLEASE, one and all. There is a way to avoid the stress of knitting needles/airplanes. LEARN TO TAT!!!! good news â€“ as of Christmas day last year, knitting needles and crochet hooks are no longer on the dangerous goods list for flying in Australia 🙂 knit away! The Australian government made this Australian knitter very happy when they took knitting needles off the list of Prohibited Items on 25th December 2010 – that’s right, Christmas Day. I flew domestically last week and a flight attendant stopped to take my knitting away but then said “Oh that’s right, knitting needles are allowed now.” As per Amy’s tips I only take wood needles through and never my Signatures!! I only use bamboo needles and usually small projects on either circulars or dpns. Of course, there seems to be a flag with the security people at the plane (the last few flights I’ve been on all had spot checking also at the gate) for people who are knitting, because I’ve been asked for a second check each time. I flew San Francisco to Amsterdam, Amsterdam to Charles De Gaulle (CDG–Paris) on 04/24/10. No problems with dpns & circs (all bamboo). Also flew CDG back to SFO direct on 05/12/10. Knitting was on lifelines, size 1.5 Brittany bamboo dpns were in the pencil case. They were searched & handled, but got through security without even questioning what they were. Also flew SFO to Honolulu 05/15/10 without issue, but then that’s domestic. Promptly sat on & broke one beloved Brittany dpn as soon as I got home <>. My needles were almost nabbed on an outbound flight from Mexico. Mexico’s rules ban knitting needles. You may be able to get some plastic or bamboo ones through security if you pack them well into your carry-on, but they are not allowed on the outbound flights. Not sure if the same is true in the rest of Central and South America, but I have heard that it is. I have never had a problem with taking knitting on a plane. I usually carry an unstarted project and cast on once I am on the plane. Like you, I use my “inexpensive” needles that I wouldn’t mind surrendering. As an aside, I did have a pilot as my seatmate once…and he was fascinated with the “traveling knitting”. When I mentioned that it had been confiscated by security at some airports, he just laughed at the absurdity.